In a recent post fellow blogger David Derrick expressed the opinion that Noel Coward, together with Britten and the Beatles, was the greatest English songwriter of the twentieth century. Which is a refreshing view, but a new ECM release highlights another pretender to the title. On her CD If Grief Could Wait Norwegian indie rock singer Susanna Wallumrød punctuates eight airs from the greatest English songwriter of the 17th century Henry Purcell with a song by Nick Drake and examples from Leonard Cohen plus one from her own pen - Nick is seen above at a photo opportunity with Henry Purcell, I wonder if they used the same hair stylist? 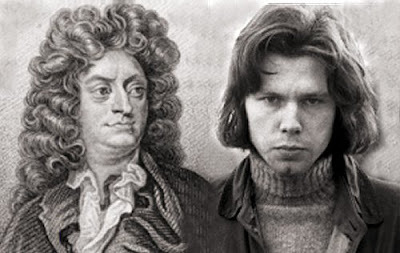 Nick Drake's reputation as a great English songwriter is now at the post-cult phase, but there is another Joe Boyd protégée whose time has still to come. 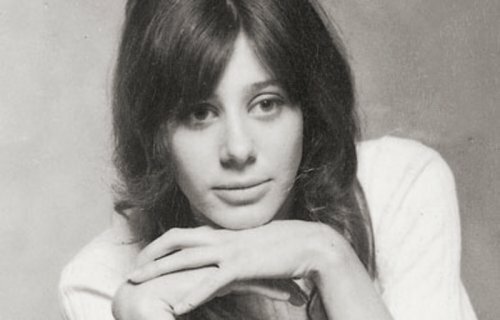 Vashti Bunyan, seen below, was discovered by Joe Boyd in 1968 while travelling by gypsy caravan to the Isle of Skye and she joined Fairport Convention, The Incredible String band and Nick Drake in Boyd's Witchseason stable of artists. On her first album Just Another Diamond Day she was backed by members of Fairport and the Incredibles while Nick Drake's arranger Robert Kirby also contributed. Despite this sprinkling of stardust the album bombed at the tills and Vashti departed the music industry. She lived the alternative life in Scotland and Ireland for thirty years while, unknown to her, the deleted record became a cult item with examples reputedly selling on eBay for up to $2000. Things started to change with the dawn of the new millenium. In 2000 Just Another Diamond Day was transferred to CD, in 2005 Vashti's second album Lookaftering was released and in 2006 a New York Press profile dubbed her 'the godmother of freak folk'. Both her studio albums are well worth seeking out. It is easy to dismiss Just Another Diamond Day as a hippie chick's hopelessly naïve paean to the hermetic lifestyle, but the naïvety is no more hopeless that that of our Murdoch hugging and Gadaffi consorting politicians. Lookaftering has an appealing mellowness born of extended exposure to the wiles of the record industry. In recent years the hermetic has met the commercial with Vashti Bunyan songs providing soundtracks for T-Mobile, Reebok and Samsung commercials - I am sure Noel Coward would have approved. Peter Warlock deserves a nomination for one of the greatest English songwriter of the twentieth century, although technically he was Anglo-Welsh. Stephen Sondheim made a compelling case against Coward's work in "Finishing the Hat", though I admittedly wasn't a big fan to being with. I would put the work of Andy Partridge in XTC miles ahead of Mr. Coward's, though I'm the first to admit that his is a niche market. Thanks for that nomination CC44. "...though I'm the first to admit that his is a niche market." I don't see that as a problem at all. In fact I would suggest that music is simply an agglomeration of niche markets. Things would work a lot better if we accepted that instead of endlessly chasing non-existent mass markets. Gavin, there is another reason why Peter Warlock sits comfortably on this path. Joe Boyd called his management company Witchseason productions as a nod towards the popularity of occultism in the late 1960s. Peter Warlock was, of course, the pseudonym adopted by Philip Heseltine in 1916. The surname Warlock (ie sorcerer) was prompted by Heseltine's interest in occultism. I agree wholeheartedly that a niche market appeal is by no means a bad thing. The best music is always made by those who aren't afraid of not appealing to everyone. I just wanted to acknowledge that I'm aware of Andy Partridge's somewhat limited appeal. Not everyone loves "No Thugs in Our House" as much as I do. I'm a bit embarrassed to say I don't know Peter Warlock, but I'll give him a listen soon. I knew the Warlock pseudonym info, though not the Joe Boyd tidbit. Thank you.